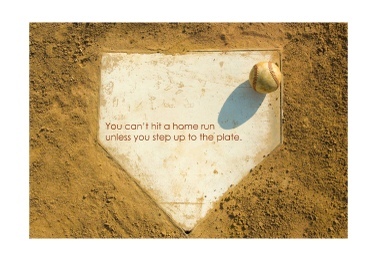 You can’t hit a home run unless you step up to the plate. How many times have you said to yourself that you want to hit a home run, get a goal, score points, make something, do something, accomplish something ~ succeed at something etc? And how many times did you really accomplish your goal? And how many times did you quit before you even gave yourself a chance to succeed? I’ve found that there are times where I have the goal in mind but somehow I neglect stepping up to the plate because I’m frightened. Does that happen to you too? You fail before you even begin and you can give yourself a million senseless reasons and give into the fear of failure without ever stepping up to the plate? Well, today’s the day to step up to the proverbial plate and swing! You can do it! I know you can! I’m your biggest fan!